We'll be featuring Christmas songs from old Hollywood films throughout the holiday season. First up is My Favorite Things from The Sound of Music (1965). My Favorite Things was not written as a Christmas song, but it has become a holiday staple because of its wintertime imagery and lovely tune. Composer Richard Rodgers and lyricist Oscar Hammerstein II wrote My Favorite Things in 1959 for their final collaboration, The Sound of Music. The musical was designed as a showcase for the talents of Mary Martin, who had great success in Rodgers and Hammerstein's South Pacific. 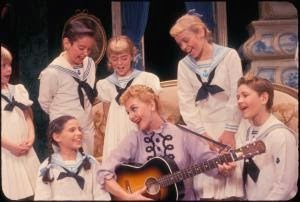 Fraulein Maria (Mary Martin) serenades the von Trapp children in the Broadway version of The Sound of Music. As everyone knows by now, The Sound of Music tells a highly sentimentalized version of the life story of Maria, a young novice at an abbey in Salzburg, Austria, who becomes the governess to the wealthy von Trapp family. In the stage version, Maria sings My Favorite Things while she is still at the abbey. Maria makes a list of her favorite things with the Mother Abbess to calm her fears about becoming a governess. Below is the official cast recording with Martin and Patricia Neway as the Mother Abbess. The film version moves My Favorite Things to the thunderstorm scene (above) where Maria (Julie Andrews) uses the song to calm the frightened children. Even before the film came out, My Favorite Things had become a popular cover song: jazz great John Coltrane recorded a 14-minute version in 1961. The film was a monster hit in 1965 and soon My Favorite Things began appearing on Christmas albums by everyone from The Supremes to Herb Alpert and the Tijuana Brass (I couldn't resist: here's their version. It has the appropriate Yuletide spirit, but, needless to say, it's very sixties). Every song in The Sound of Music is a classic, but My Favorite Things is special even by Rodgers and Hammerstein's high standards. Rodgers lovely tune, reminiscent of a Viennese waltz, melds perfectly with Hammerstein's sentimental lyrics filled with images of home and the Christmas season.